Traditional and refined, this swivel bar stool was designed with your comfort in mind and brings elegant style to your bar. Tapered feet and rolled arms combine with an upholstered back with nail head trim and button tufting for a handsome look. 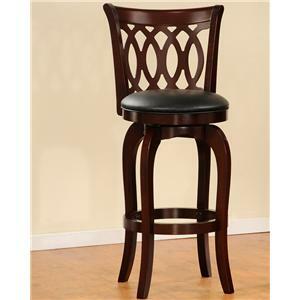 Completed in a Dark Cherry finish, this bar stool is exactly what you have been looking for. The Wood Stools Eastwind Swivel Bar Stool with Button Tufting by Hillsdale at Carolina Direct in the Greenville, Spartanburg, Anderson, Upstate, Simpsonville, Clemson, SC area. Product availability may vary. Contact us for the most current availability on this product. The Wood Stools collection is a great option if you are looking for Traditional furniture in the Greenville, Spartanburg, Anderson, Upstate, Simpsonville, Clemson, SC area. Browse other items in the Wood Stools collection from Carolina Direct in the Greenville, Spartanburg, Anderson, Upstate, Simpsonville, Clemson, SC area.